Have you ever had an idea for a rug keep nagging at you until finally you just sit down and scribble the idea on paper.... or directly onto the linen? Well this little design came about in that way except I knew better than to just draw it up on linen.... as more likely than not there will be someone who wants to hook it up and that would mean redrawing it on paper anyway! So quickly the scribble was transferred to linen and I began hooking away! Oh you could say there was a little reverse hooking going on... LOL! For you newbies at rug hooking that means pulling out your loops and hooking again... something that becomes second nature to most of us! Well finally... the design took shape! 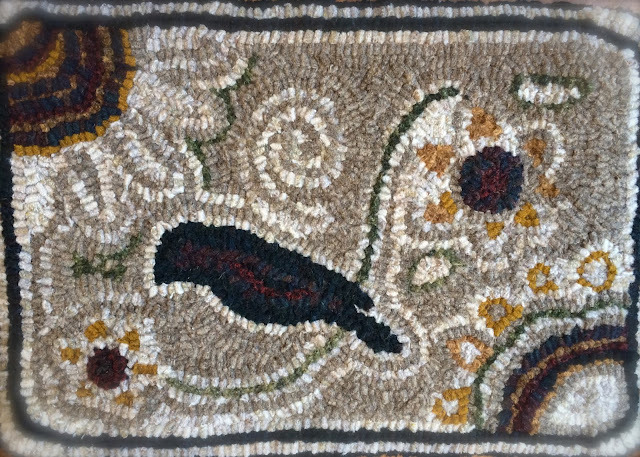 My sunflower's petals in the top left corner of the rug are hooked with the same background wools. It gives the hint of petals without being filled in with a color.... not adding as much "weight" to that corner as if I had hooked in say a sunflower color! Something I discovered worked after fussing and fighting with too much going on in this small sized mat. It measures 10 by 15 inches and I rounded the corners. I left the sunflower petals in the lower left corner open too and by not filling them in with color I felt it gave more of a lacy appearance and lightness to the design! A new little dittie you may choose to hook! If so I have the PAPER PATTERN all ready to go and you can find it in my Etsy shop. 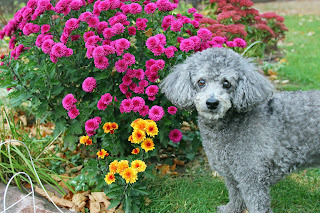 Look in the upper left corner of the blog and click on pattern! Takes you right to Etsy and the listing! Lots of things going on here late in July! The girls will be coming to hook again on August 11th(second Tuesday)... our regularly scheduled hook-in for each month. It sounds like we will have some new folks joining us this time! If you are in the Rice Lake area maybe vacationing and would like to join us... just give me a shout! We'd love to have you!! 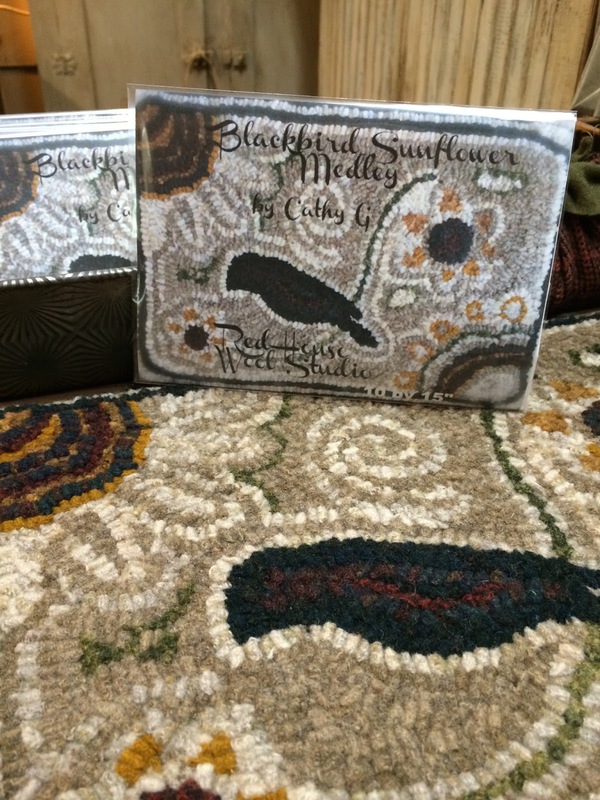 Thank you all so kindly for your continued support of me and my little rug hooking design business! Hopefully I can get another one out of the old noggin' and onto linen soon!! For some reason lately I've been hankering to get ahold of a set of those old wash tubs they used with the old wringer washers in days of olde. I've seen them fixed up so cute on people's patios with flowers or perhaps filled with ice and used for a beverage holder when entertaining! Well.. when Dave and I and the pups ventured to a local Flea Market in his home town of Praire Farm this weekend I almost couldn't believe my eyes! Yup... there they were! With a little wheelin' and dealin' to settle on the $27.00 price they were mine! When we got them home Dave remarked that they must have used the same paint on the metal stand that our house is painted as it matches perfectly! I bought some free-range chickens (frozen) and a jug of maple syrup and with that we headed back home! 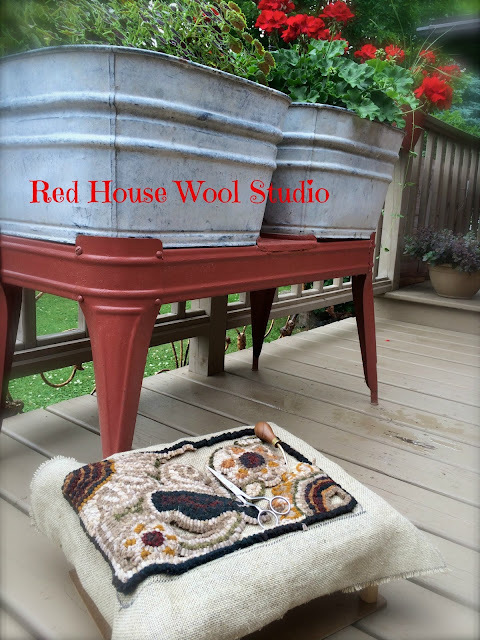 Feeling creative and happy, my rug hook and frame made an appearance yesterday afternoon as well. Haven't been hooking much lately and the desire to do a little free-form hooking from a roughly drawn sketch on the linen resulted in a kind of artsy little design. I've been wanting to play with a couple of new wools that arrived here in the studio too. Another busy week ahead for me! Tomorrow Smokey gets to go get groomed. Max will ride along and usually sits on my lap the whole time hoping he doesn't have to have a bath as well! He had his appointment about 4 weeks ago so he has a little time to go before his appointment. But I don't think he knows that when we get there... tee hee...! and maybe a little hookin' or stitching too. Sunflowers and pumpkins are right around the corner!